The Nanticoke people consisted of several tribes: The Nanticoke proper (the subject of this article), the Choptank, the Assateague, the Piscataway, and the Doeg. In 1668, the Nanticoke emperor Unnacokasimon signed a peace treaty with the proprietary government of the Province of Maryland. In 1684, the Nanticoke and English governments defined a reservation for their use, situated between Chicacoan Creek and the Nanticoke River in Maryland. Non-native peoples encroached upon their lands, so the tribe purchased a 3,000-acre tract of land in 1707 on Broad Creek in Somerset County, Maryland (now Sussex County, Delaware). In 1742, the tribe met with neighboring tribes in nearby Wimbesoccom Neck to discuss a Shawnee plot to attack the local English settlers, but the gathering was discovered and the leaders involved arrested. Some moved up to Pennsylvania in 1744, where they gained permission from the Iroquois Confederacy to settle near Wyoming, Pennsylvania and along the Juniata River. They moved upriver a decade later. They joined the Piscataway tribe, and were both under the jurisdiction of the League of the Iroquois. The reservation on Broad Creek was sold in 1768. The Nanticoke Indian Association of Millsboro has been a state recognized tribe in Delaware since 1922. The Nanticoke Lenni-Lenape Indians are a state recognized tribe in New Jersey. "Tee" Norwood was elected chief and served until 2008. That year Larry Jackson was elected as chief, and Chief William H. "Thunder Eagle" Daisey currently leads the organization. Some Nanticoke settled across the Delaware Bay in southern New Jersey, where they joined the Lenape and intermarried with them. 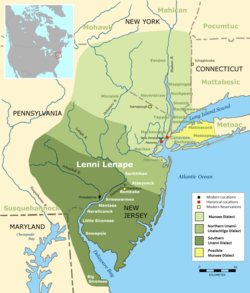 The Nanticoke Lenni-Lenape Indians of New Jersey are recognized by that state and based in Bridgeton. They have numerous members with mixed Nanticoke and Lenape ancestry. Both tribes were historically Algonquian speaking, and there have been years of intermarriage between them. ^ Harold B. Hancock (1976). The History of Sussex County, Delaware. p. 6. ^ a b c Brown, Robin (1 Jan 2008). "The backstory on the Nanticoke Indian Tribe". delawareonline.com. Retrieved 2008-08-11.